A selection of Gift Tags (luggage labels). All made in the UK from recycled paper in a range of sizes and colours. 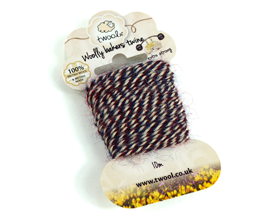 Plus Twool - eco-friendly British wool twine to tie your tags with. Made in the UK from the wool of Whiteface Dartmoor sheep.